Hello everyone! I'm new here! Is this Coprolite? Found it in PA Down by the river. Click on images to find larger pictures. 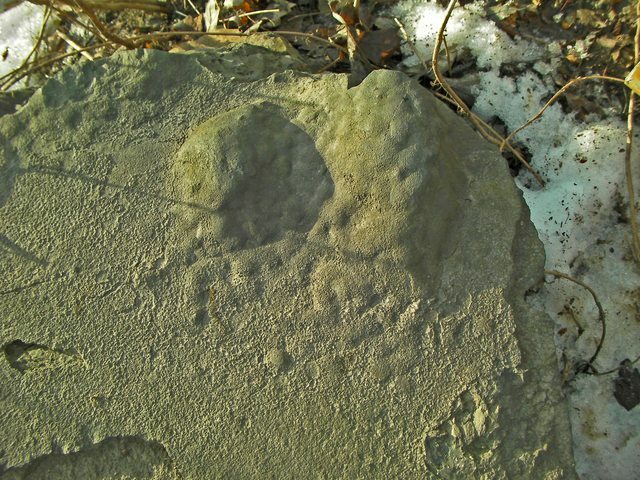 My first impression is that it is some kind of bioturbation cast, with the matrix slab being upside-down. The feature doesn't look like a distinct object embedded in the matrix. What is the size? Where in PA? It's in Harrisburg, PA Central PA. Along the Susquehanna river. The whole rock is about 2' long. The larger pile or depression is about 9" - 10" in. long. Smaller one 6" - 7" in. long. I'm with Auspex - little chance it's a coprolite. Thanks Carl for following up. Nice to meet you guys. Ok any guesses on what it might be? Eggs, seed pod? The whole stone probably weighs 250-300 lbs. So It's not coming home with me. 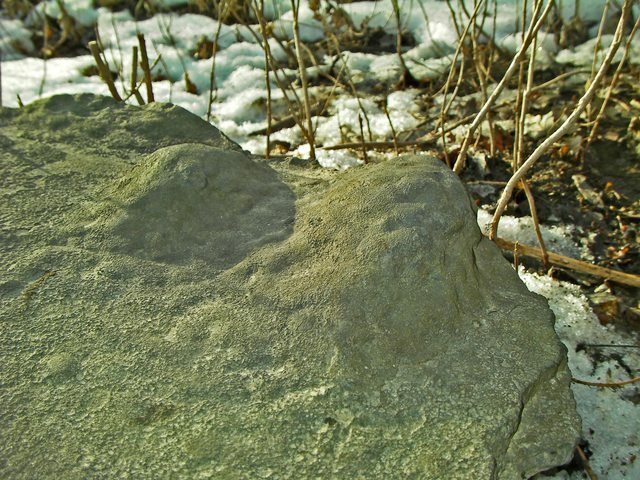 I guess next time I'm out there I'll look it over to see if I can find any other fossils on it to help me date it. Any advice on how I could proceed with dating this object is appreciated. I doubt it's a fossil. It's much more likely some non-biological geological feature. 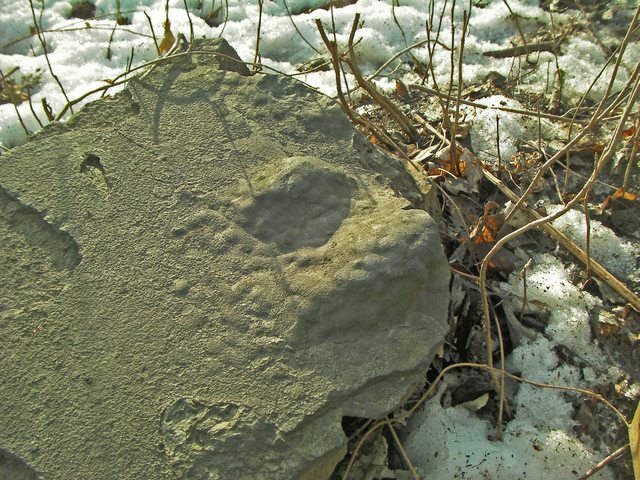 are there casts and molds of fossils in the broken edge? what are those cavities? 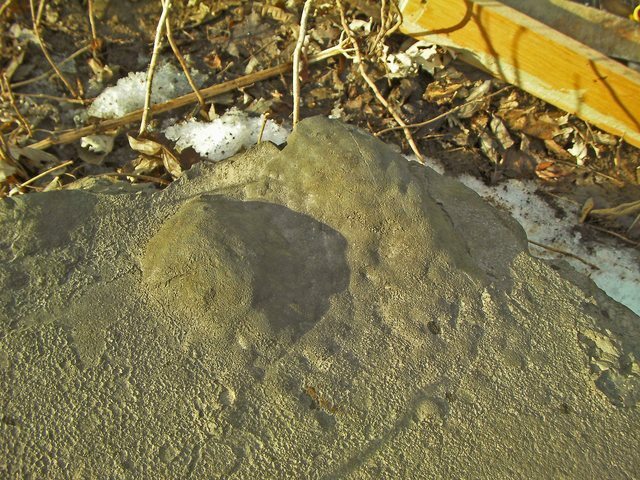 My first impression or gut tells me a weathered stromatoporoid. Google image this and tell me what you think webthing. Shouldn't we see some structure in the cross section? mikeymig is on track, as I see it. Looks like an Algal Mat. It does not appear to have any internal structure from the one side view. Auspex picked up on that. The last stromatolites I had seen was in the PreCambrian of the Snowy Range in Wyoming. added: If it were found to be a coprolite... I want you to find the "creature" that did this number! 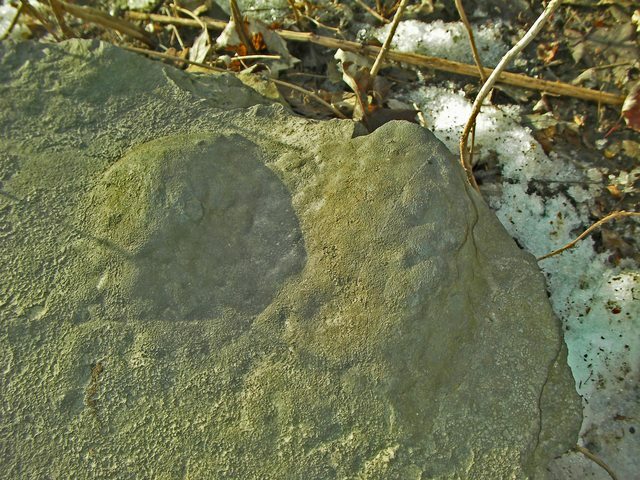 The Devonian Stromatoporoids I find here in NY are very thin. 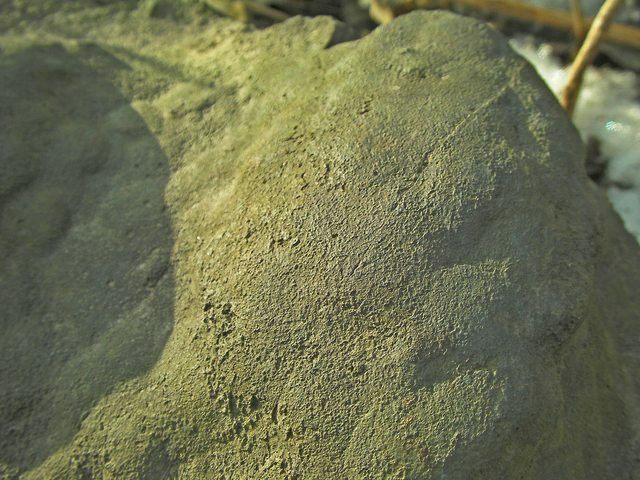 If this is a weathered or the impression of one, then you wouldn't see anything in cross section. Or like Ray said, its an Algal Mat. 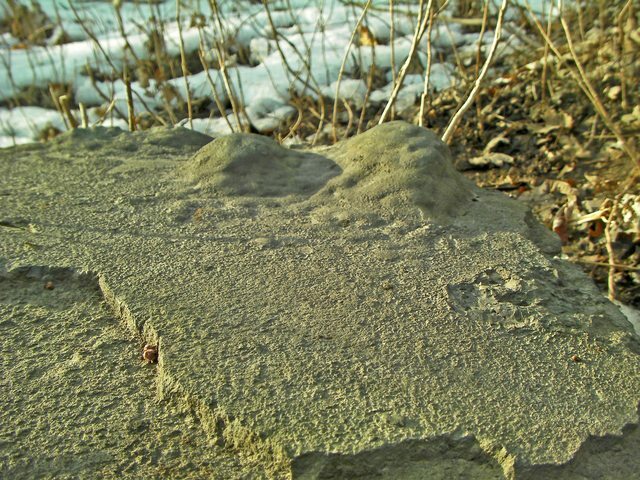 Stromatolites and Stromatoporoids are two different critters. OK, let's look another way: if it's an algal mat of essentially two dimensions, what is responsible for the three-D contour it follows? How about algal mat covering sponge? 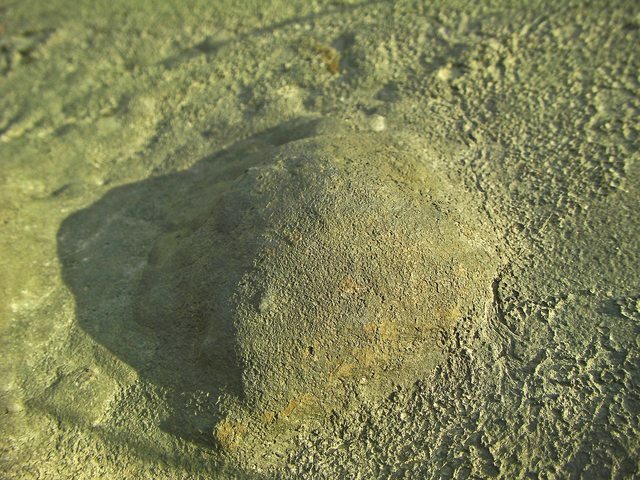 The top of the algal mat, assuming that there are no silicate sponge parts, resisted underwater and current erosion. 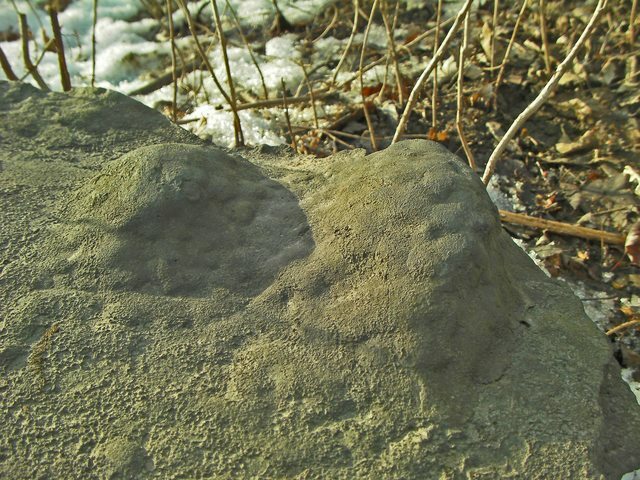 As the current washed soft sediments away, the mat grew into the freshly exposed surfaces. It continued until fresh sediments covered up the mat and it ceased growing. Bullsnake and the sponge. Now that is thinking outside of the Stromatolite. If silica spicules are found beneath the "algal mat"... ding... ding... ding. Our combined imaginations came up with something.... or other. I still can't shake the suspicion that the orientation is upside-down, and that this is a positive of a depression. Look how perfectly flat, level, and featureless the rest of the rock's face is. Are you making a negative remark that was positive? Or a positive remark about what must be negative? What is it? If this is a positive feature of a negative depression, the sediment within will have varves or layering of fine sediments to fill it, negatively. 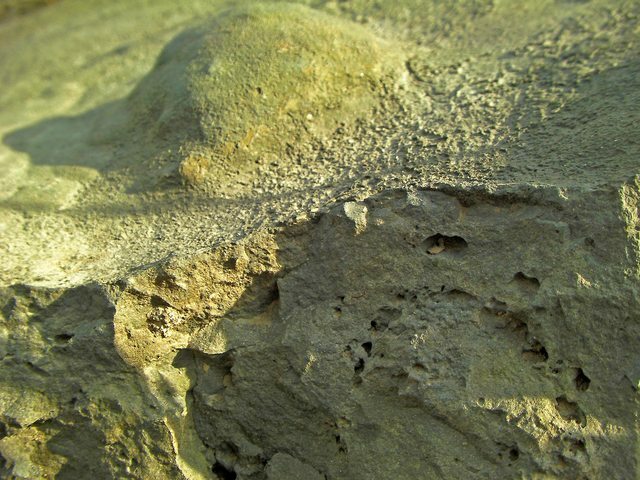 Your negative positive cast a negative to those of us who, without any knowledge about anything negative, or mildly positive... point out that any reasonable thinking Forum Member will agree this is a Algal Mat with positive relief upon a stable sedimentary formation. Are you now a positive negative or negative positive to this discussion? 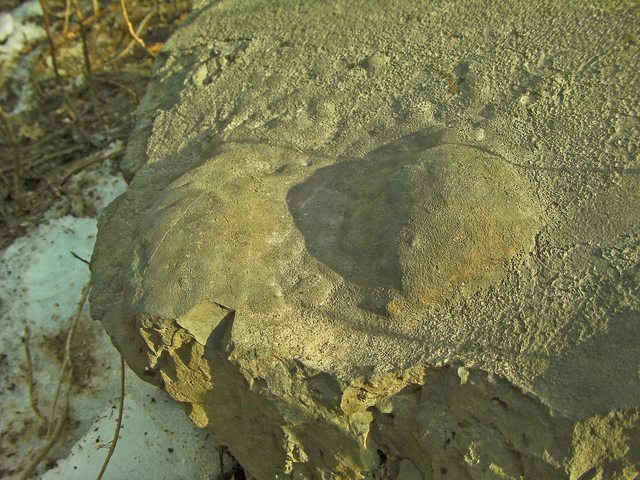 If so, where are your varves and why do the varves not express themselves in a positive accumulation of sediments in the formation cross section? And... I hope someone else will jump in and provide additional, positive claims, so we can be negative towards positive positions we do not agree. Ahhh, call me thick-headed...what you're saying finally sunk in! Now with that in mind the piece looks really out of place. Are we sure it's even rock, as in stone, and not dumped concrete/cement? 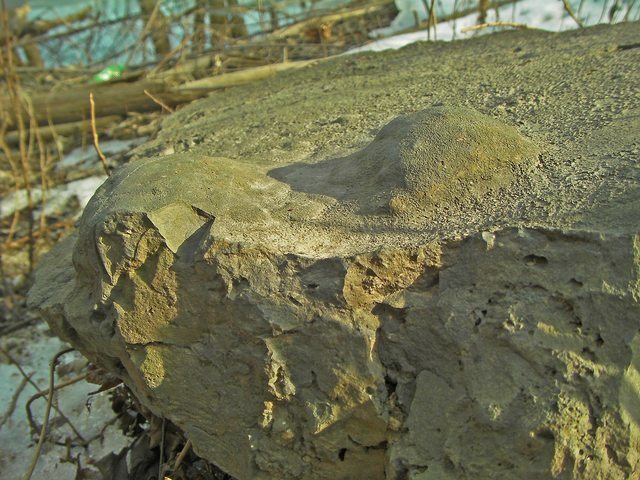 100% sure not dumped concrete/cement. That's the first thing I checked. Thank you all for responding. Googled Stromatoporoid. Mike. 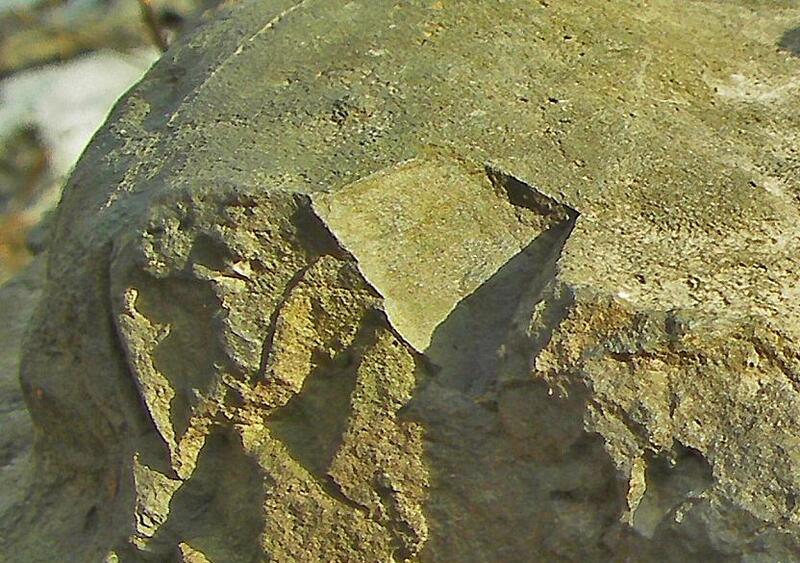 Stromatoporoids are difficult to identify without slicing and polishing to see the internal microstructure. 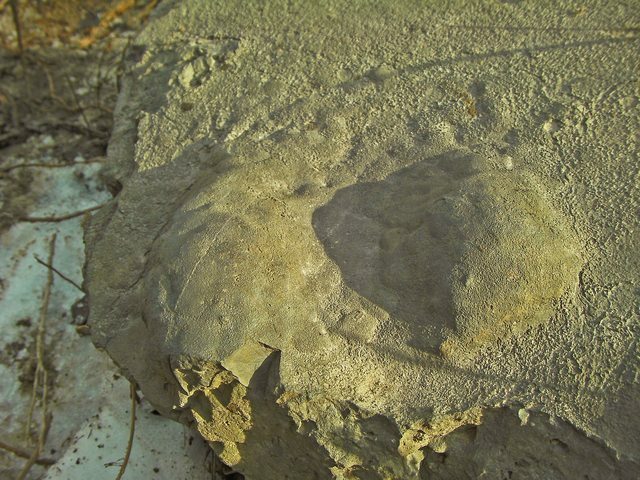 This specimen has large mound-shaped mamelons. Stromatoporoids are useful markers whose form and occurrence can diagnose the depositional environment of sedimentary strata. Stromatoporoid morphology is quite variable. 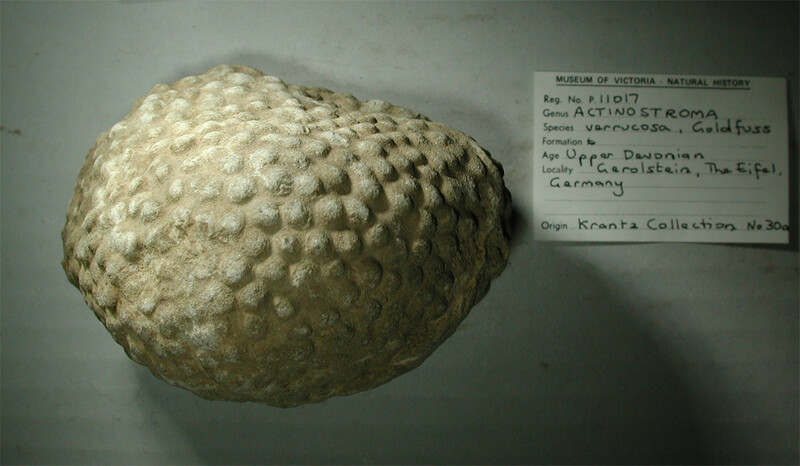 They are best known, and most typically found as massive "domical" structures, but other types exist: conical, mushroom-shaped, columnar, branching, or even thin and reed-like. 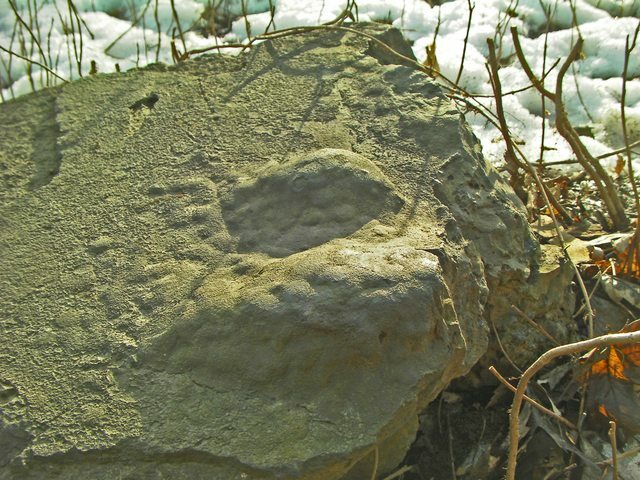 Since they were both large and mineralized, they are frequently preserved as fossils. Stromatoporoids frequently formed reefs with bacterial stromatolites, which probably accounts for their name. Indeed, misidentifications of stromatoporoids for calcified bacterial mats, and presumably vice-versa, are still being corrected. It may be cement, but by definition, concrete requires aggregate which I do not see in the cross sections, so it can't be concrete.